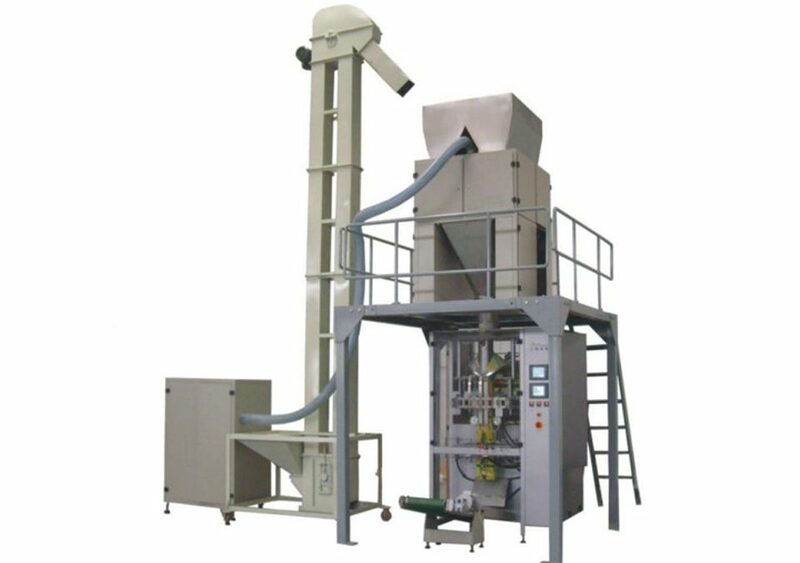 The SGB-Z full automatic granule packaging equipment consists of seven parts which are the elevator, SGJ-ZF six hopper weigher, SGB vertical packing machine, working platform, products conveyor, Nitrogen Gas Generator and air compressor. By operating the LED touchscreen can complete the process of weighing, packing, product conveying, etc, the packaging range is from 50g-5000g, it is ideal equipment for packing granule food such as rice, white sugar, etc. 1. This packaging unit consists of PLC program control system, the servo system and pneumatic actuator system to form its drive core. 2. 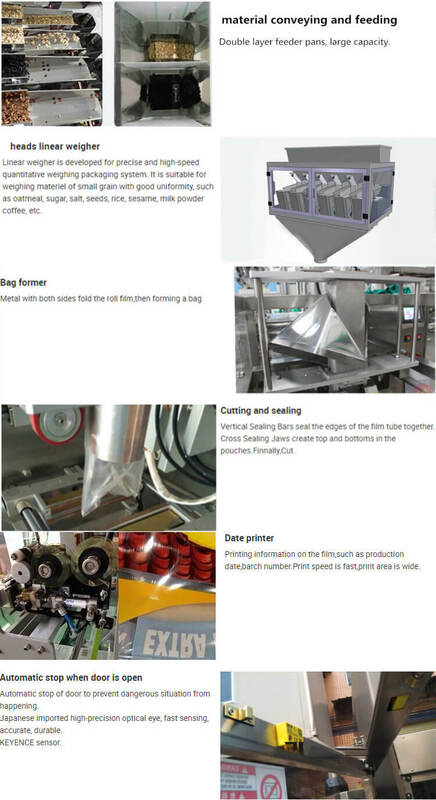 By man-machine interface touch screen to finish from weighing to bag packing in the process of counting, date printing, nitrogen (exhaust), finished product delivery and other function. 3. 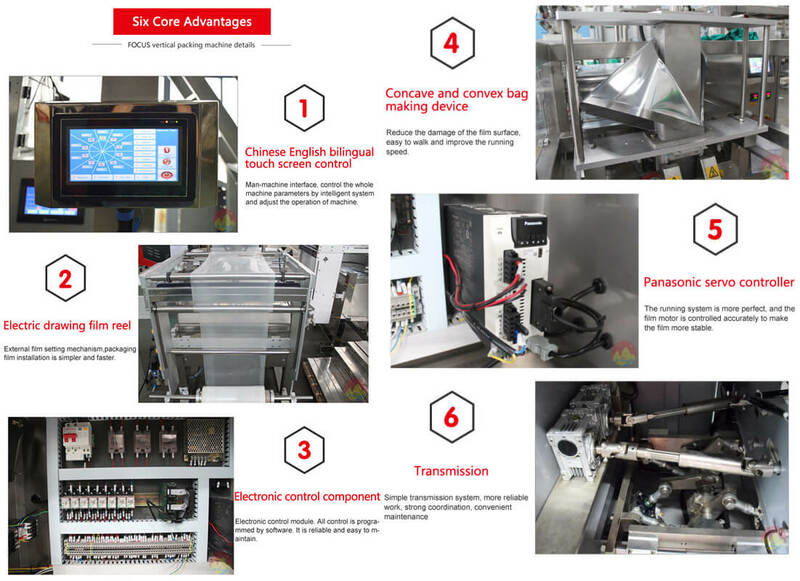 The setting and modification of packing parameter are carried out through the touchscreen, it can memory and store 10 kinds of packaging parameters of different products, which can be used at any time without the need of resetting. 4. It can make a pillow bag, angular bag, handbag, punching bag and multiple continuous bags according to the customers' requirements. 5. Adopt fiber recognition of signal transmission and the encoder determines function, higher accuracy. 6. Packing machine employs a servo motor drawing film and transverse sealing, making the equipment working stable. 1. Working process: material--lifting and conveying--temporary storage bin--weighing and filling--packing and sealing--product output--counting and packing bag. 2. 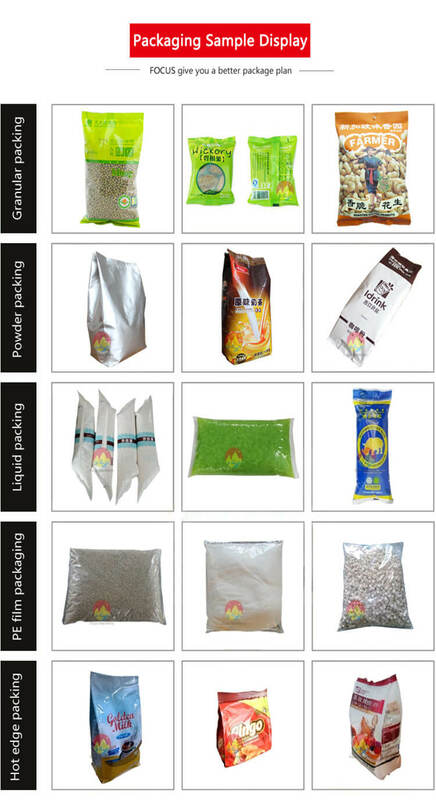 Application: it is suitable for packaging kinds of granule material such as rice, corn, sugar, monosodium glutamate, sesame, wheat, soybean, feedstuff, additives, etc. 1) PLC control system from SIMENS, LED operation interface, pneumatic and servo motor. 2) Optical signal transmission, heating by the temperature controller, constant temperature thermal sealing. 3) Low noise, high packing speed, printing production date, suitable for making various shapes bag. 4) Packing material: PE+PET composite film, bag size: 50-490mm*80-375mm (L×W). 3. Bucket elevator: made of Carbon steel spraying plastic or 304 stainless steel, feed smoothly and no broken.